Your guests will certainly enjoy a cup of this creamy mocha cappuccino or delicious hot cocoa mix at your next Baptism, Christening or other religious event. Comes sealed in a white gloss pouch with 1.25 ounces of cappuccino or hot cocoa mix. 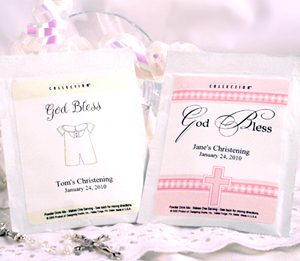 Assembly: These favors will arrive bulk packed along with your self sticking label sheets included, for easy application to each packet.